This is an old challenge now, this thread is archived. If you scroll down to the Challenge #8 section of the downloads page, you’ll see that the models can still be downloaded for your tests, and also that a gallery has been made of top entries. Feel free to browse this thread to see what others have posted, even though you can no longer post here. Lighting Challenge #8 is on-line! All shading and rendering techniques are fine, as long as the scene is lit in 3D. Any minor modeling tweaks you want to make to the scene are OK. This scene was built to be rendered from this camera angle; if rendered from other angles it might not appear as complete. After you’ve posted your own entries, please share how you did it and try to help other people with their projects. I seem to be having a problem downloading the Max file. after extracting it 3dstudio max cannot open the file. Can you import the .obj or the .fbx file? BTW, big thanks to jojo1975 for making this Max file, he says it works but perhaps he used a more recent version of Max? Today after seeing the image that you have provided by you for the challenge i was bit suprised as this was one of those inspired versions of AntiFAn’s(www.antifan.com)work.Many people have tried this image before including myself I think if we provide some other image(model) for the challenge it would be nicer. My version which i made some months ago is showng above .I made it in Maya without any GI solution. OBJ. file worked. Thanks alot. I will post my first results come monday. That one is max9 yep. Just letting you know that Im super excited to get to work on this. Now that school is out for a while I will have something to work on for a while to keep me busy until classes get going again. That’s a good start. A lot of people have asked for this scene to be a lighting challenge. I know it must seem unfortunate to you if you had to model that one yourself and now others are downloading it, but it did give you a head-start. In terms of your image, I’d say first that the sun looks a little too much like a spotlight right outside the window. In real life, the sun is very far away. You wouldn’t see diverging lines in a sun shadow, you’d get a perspective more like a directional light or a spotlight translated very far away. You might also rethink putting the 2D noise on the fog, it looks very procedural. One thing you’ll notice about sunny days is that there’s a lot of light coming from many directions. You need soft light coming from all angles in a bright window. 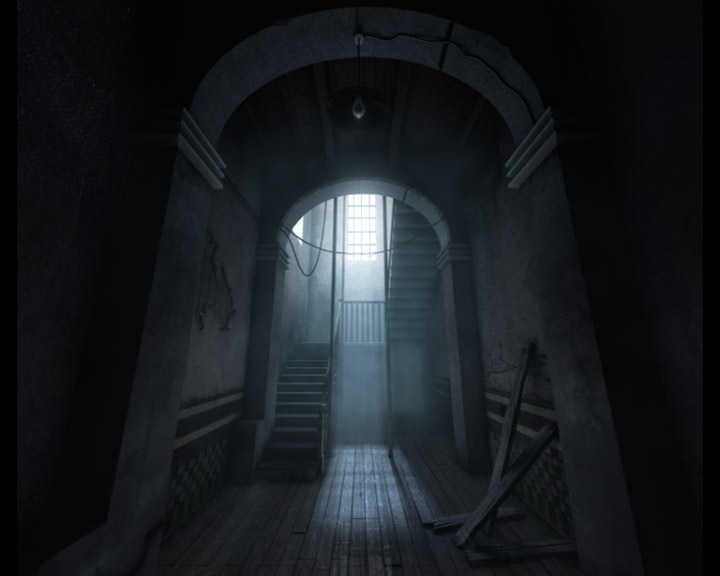 You should think about whether the rear columns near the stairwell should be brighter or darker than the columns closest to us, if the light is all coming from the windows in the background. Also, shouldn’t the sunbeam hitting the floor be much brighter than the bounce light on the columns? Christmas holiday in Egypt is one day, and some obligatory on job training is going to eat up almost all my spare time. I might not be able to finish this challenge at all, but I'll give it a try. If you use Lightwave, MooseDog has just donated an .lwo file that is all cleaned up and has material names and is ready to go, it’s on the download page. If you use Maya, a few notes: The .obj imports well into earlier versions of Maya if you don’t have Maya 8 yet. Most of the models come in without “visible in reflections” checked in their render stats,change this for all of the models at once in the Attribute Spreadsheet if you’re going to render reflections. sjmcc - Thanks for the Cinema 4D file! It’s on-line now. jipe - Hard to say much. I don’t see the “light from outside” you mentioned yet. In terms of color management, my favorite trick is to find some digital images for reference, any kind of art or photography or frames grabbed from DVDs will do, and try to match their tones. jojo1975 - Good start. Looks a little glowy and saturated on the right stairs. Is the devil going to cast a shadow? I’ve made an XSI version of the file, where should I post it?? hmmm… i’ve tried all the files, but can’t seem to get clean geometry on the import into max… the archway has some nasty faces covering it for some odd reason. When I open in maya the file is fine though… Tried with max 9 and max 8 as well. Any ideas? Uhm I dont’ know if a cartesian devil cast a shadow… but here’s an update with rim light too (omni near the stairs on the right+ a cast shadow to the FDirect for the “key” light + a fill light in front of the devil). The omni add some shadows on the left that I like (it make a bit more “spooky” the all image). i’ve also raised a bit the cartesian devil. It does look like we’re having geometry problems in some software. 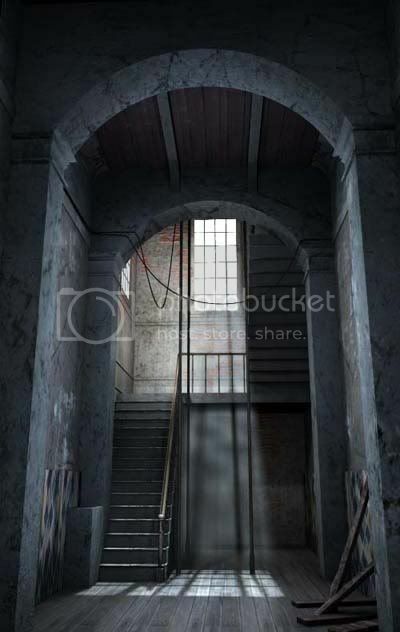 That “triangle” cutting through the steps on the side of the stairs in jojo1975’s render certainly isn’t there in the version I have loaded in Maya. Maybe there is a n-gon with too many points on the side of the stairwell, and it didn’t get translated correctly into some file format(s)? If anyone has any feedback on which file formats or which software is showing that problem, we could probably back up a step, subdivide the n-gons into quads or something more reasonable, and try converting from obj or fbx again. a friend of mine prepared an XSI Version of the scene. I cant wait to participate in this lighting challenge! How can we access to your friend’s XSI scene?? Did you guys send it to Jeremy so he can post it along with the other scene files(Maya, C4D, etc) , or do you have a direct download link? ?